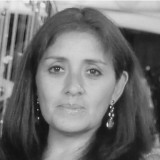 Rosa María Mendoza is a senior consultant in strategy, project management and marketing with 15 years of experience in the public and private sector. Rosa María is a great and very down-to-earth process manager as well, with most of her consulting work focused in the organisation and functioning of the energy and health sectors in Peru and Latin America. Recently, she managed for the energy regulatory body in Peru, a large study benchmarking tariff systems for renewables around the world, and designed the Peruvian auctioning system. She has a great deal of knowledge in energy prices estimations and energy trade in Peru. She holds an MBA and Post graduate studies in Marketing from Universidad ESAN. She also holds an Industrial Engineer degree from Universidad de Lima (Perú).